WataugaWatch: With Anne Marie Yates in Charge, What Could Possibly Go Wrong? With Anne Marie Yates in Charge, What Could Possibly Go Wrong? 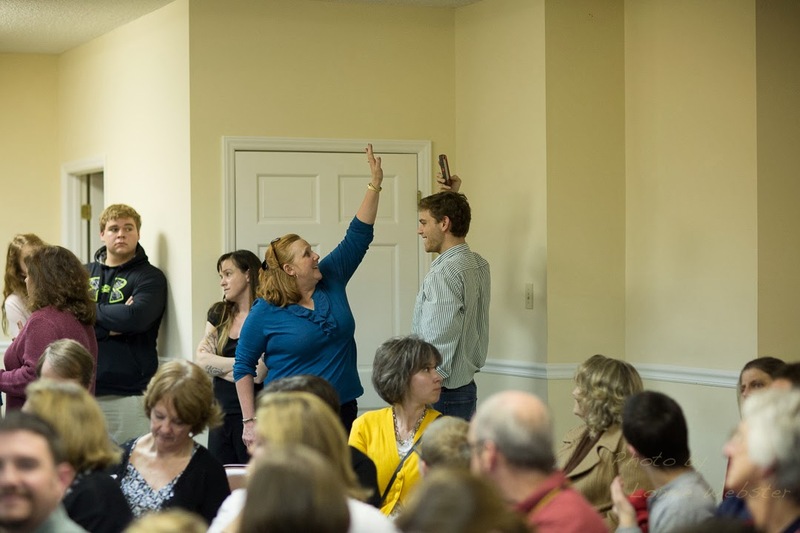 Apparently, Watauga County GOP Chairwoman Anne Marie Yates was acting in the capacity of “staffer” to Sen. Dan Soucek at the Deep Gap Volunteer Fire Department last Thursday night for the public forum on education, the meeting that is now notorious everywhere across the state of North Carolina. Anne Marie Yates was certainly doing everything in her power to stop smart-phone recording of the event, and we’re assuming it was she who ordered a Green Valley Elementary School third grade teacher removed from the room by Sheriff’s deputies. 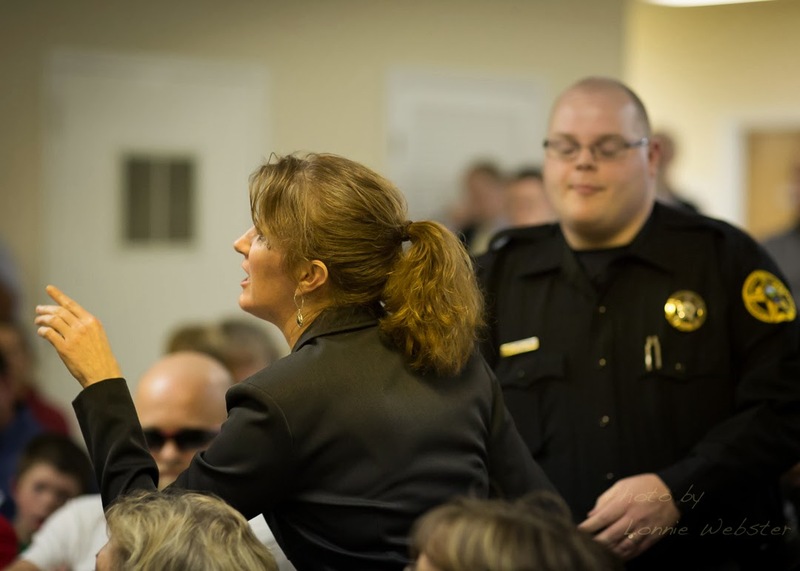 Evidently Chairwoman Yates learned some lessons about crowd control at the disastrous August 12th Watauga Board of Elections meeting. If you’ll recall, at that maiden voyage of the new Watauga Board of Elections, Yates’s Republican appointments delivered a public performance so disastrous that we’re still awaiting the fall-out of a State Board of Elections hearing on a petition to have those Republican members removed from office for gross irregularities and malfeasance. What did Yates learn from that BOE train-wreck? (1) Prevent YouTube videos at all costs. (2) Deal harshly with anyone protesting your power. That’s the only explanation that makes perfect sense for why the clueless Senator Soucek would have allowed a Watauga County teacher to be muscled out of a public meeting – “on orders by his staff.” That teacher, and all others in Watauga, had been invited to that public meeting, after all, by Sen. Soucek himself, who had claimed that he wanted to hear citizen views on his policies toward public education. You can make up your own mind whether Sen. Soucek wants to hear from anyone who’s not in control of his strings. The whole question of how Sen. Soucek – and his blessed “staff” – could make use of the Watauga County Sheriff’s Department for their dirty work in this particular instance has yet to be answered fully and definitively. But we hear that the County Attorney, Stacy C. “Four” Eggers, interpreted the law on that matter prior to the meeting, so we guess that everything was perfectly kosher, since Four Eggers was also running that BOE meeting in August by remote control. It's now a moot point whether the Soucek "staff" could prohibit recordings of the forum, since a complete audio file exists and is available to the public. Someone needs to get a good civil rights lawyer to move to Boone. There is a lot of work out there for the right attorney! It is interesting how many people still admire these criminals. The Watauga County Republican Party is a train wreck. I am totally dismayed at Senator Dan Soucek even merely requesting that the meeting not be videotaped. Seeing GOP chairwoman Yates show her a... doesn't surprise me; her reputation in the news and first-eye accounts of her reputation as chairwoman precede this event. Hearing that GOP executive committee member Stacy "Four" Eggers was involved leads me to believe this was a GOP political event staged as a Senator Soucek education forum open to the public. Who was paying for those deputies? Why are they in uniform if they are enforcing rules made up by the GOP instead of NC State laws? It looks like Steve Franks got a audio recording. How is it that GoBlueRidge can put a recorder on the table and others are prohibited from making recordings. Why specifically want to stop video? I agree, with the past video evidence, Senator Soucek was afraid he would make the news. And, I believe he specifically was afraid that the chairwoman would be the take the spotlight. Well, she did! And, you can't start a public meeting off with a tyrannical move and expect civility. That is what happened set the Board of Elections debut. Senator Soucek, you best distance yourself from the local GOP! Ike a lawsuit in the making to me! Looks like DG is off her meds again. Anonymous that thinks I am off of my meds. Do you have anything to say about the issue at hand or are you so shallow as to only be able to spew out personal attacks? At least I use my name! Bring it on! If you ever understand liberals and progressives are working for the same transparent, inclusive government you also seem to want you would make a hell of a good ally , you're passionate, committed, courageous and do you homework unfortunately you have been wrong on several pass issues that greatly benefited our community or would have benefited our community. Liberals and Progressive as you well know believe all citizens should have equal rights, freedom and liberty. I do believe that most of us want transparency, regardless of affiliation. I also believe that most of us have the same goal; we just don't always agree on how we get there. As I grow older I grow wiser. I look back and say to myself all of the time, "What the hell were you thinking?" I admit I was naive to partisan politics. I admit I trusted too much! And, I don't claim to be perfect. But, I am not a party worshiper. I try to get the facts and I call it as I see it based on the knowledge I have. I am not trying to be an ally to any group; I am just a concerned citizen who wants to protect the Republic for which it stands! I was just beating myself up over defending Senator Soucek 3 days before his forum. A friend reminded me, "Deb, you were using the knowledge you had at that time. ". That's right and now I see what Dr. Fonseca was trying to tell me. I like Dr. Fonseca. He appears honest and candid. I respect that in a person. DG are you saying that you are NOT off your meds? Or maybe that they just aren't working anymore? Off her meds? From what I can tell Debroah is the only sane republican left in Watauga county. since all the rest are busy either trying to trample on the rights of voters, the rights to be heard, or the rights to hold them accountable. Though I disagree with her 90% of the time on issues, at least she sticks to her principles, and she's willing to debate on the issues. Not try out for the WNBA the way Anne Marie Yates was doing to Ian at the meeting. Seems to be par for the course for the conservative trolls who post here on WW. Instead of trying to have a meaningful conversation, they insult and attack people who comment on this blog - that's probably why a lot of the posts don't have any comments on them. People get tired of getting attacked for expressing an opinion. As for Deb Greene, I agree with you Jesse. I disagree with her most of the time, but she does not suffer fools on either side of the political spectrum - she calls em as she sees em! And she is absolutely right that we need much more transparency in all levels of government. Green is a Republcian hater and a tool of the williamsons. She is no more a "Republican" than Pam is. If she had any integrity she would go ahead and register as a Dem with the rest of you haters. You are the only ones who support her and you do so because she supports your dem candidates and attacks all republicans which is all you care about. Jesse Steel, Debra Green and Pam Williamson. Now there's a team! See it's comments like yours that make me laugh at the hypocrisy and hate you're displaying my too cowardly to use a name friend. Now that Debroah has the gall to disagree with where you stand, and won't lockstep tow the line. Tell me, how much a fake republican and Williamson tool was she when she was working in support of Amendment One? Or trying to call Jim Deal to account? That took me 30 seconds to come up with, give me five minutes with google or the Watauga Democrat news archive I'm sure I could come up with more, or let Mrs Greene speak for herself on the matter. But commit the cardinal sin of doing something like cross Madame Foxx (brass balls on that one btw Deb) and then welcome to pariah land! Not that I'm minding, this civil war in the Republican party is pure popcorn material at my house. That in a nutshell is why Debroah is a real Republican (at least in my opinion, she's free to disagree) And you are little more then a fanatical teahadist twit. One so blinded by your hate of Obama you're pushing away the very people who could help you unseat him and the Democrats. As for the three of us teaming up, well I'd be careful what you wish for on that front. Thank you Mr Steele. I'm glad you agree with me that DG is a Democrat tool. erged Now, please go clean out the slurpee machine. And people wonder why I don't comment on WW much . . . I point out two clear cut examples of how DG is about as Republican as you can get, and we're back to totally ignoring basic facts, reality, and straight to the personal attacks. People like you anon (and the slurpee hint gives me a good clue as to which cowardly anon you are) really just have to keep resorting to the pointless personal attacks when you can't debate the points being raised, and can't answer the questions being raised of you. Such as "Was DG a Republican or not when she was front and center protecting your idea of traditional marriage?" What is it about giving a simple yes or no to questions such as this that is so hard? You can take jabs at my job all you like though, all it shows is you don't have a leg to stand on issue wise, and why your party keeps having to resort to the tactics of "If we can't win on the issues, lets just make sure no one can vote." which is why you lost, and why Republicans are going to keep losing. For the record too? My sister who teaches at a local elem school said after that meeting even every Republican teacher was pissed off at Soucek. And no making fun of me is going to change that fact. Though while you do find it cute to attack me and devote your energy on harping over myself and Pam/Jerry, again you're not focused on actual issues or actual problems that might get you actual votes if you'd work with people rather then treating everyone who doesn't agree with you perfectly as the enemy. But my all means do please continue down your current path, this insanity is entertaining as ever.